The Apson 1142 Sports Watch was made for a very specific person- the sporty man. Which is logical because it is defined as a men's sports watch and its included features would make one think that this was the perfect outdoorsy accessory. However, unlike most other accessories, this one is not very versatile. I got this watch for my husband as a stand in until we could afford one that he could sinc with his phone. The watch is shock proof, water resistant, and well structured. It is everything you could hope for in a watch. It is just not practical for the average person. We had a wedding to go to this past weekend and I thought that the watch would be a nice addition to his semi-formal apparel. However, midway through the ceremony, he took the watch off and stuck it in my purse. It was too large and bulky to blend in well with his dress shirt and suspenders and he felt that it stood out too much which is a shame because it has a nice modern design that has just been exceptionally magnified to give you the Apson 1142. The watch is far too large for a woman's wrist. It war nearly too big to look decent on my husband's. 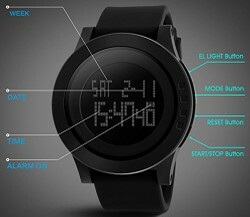 He liked that it had a stopwatch included and that the design is sleek and simplistic. However, the face of the watch is so large that he was afraid that he would scratch it as soon as it bumps against anything. The sports watch is not made for actual sports, but instead for those who wish to be seen as such. All in all, the Apson 1142 is a very nice looking watch, and the design in and of itself is very fashionable, however, it much is quite impracticable. It is too large to be used for every day use and would never pass as a "sports watch" like it is advertised to be. The company needs to reevaluate its design or at least the size of it. This watch may work for exceptionally tall or large men, but it will not be suitable for anyone less than. Sunglasses are a basic requirement for any man. Come check out the latest in mens sun glasses before you catch yourself out and about in the rays. Beanie hats are the must have fashion item this winter. Discover where to buy beanie hats and find a cool beanie accesory for men this season.